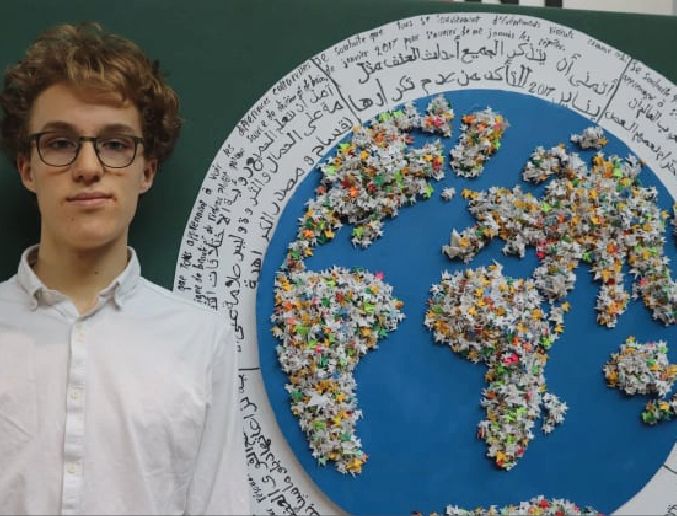 Quebec City high school student Arthur Thompson de la Chenelière meticulously folded 6,000 origami cranes to pay tribute to the six men who died in the 2017 mosque shooting. His art piece was one of several tributes to the victims on display at Université Laval Tuesday to mark the second anniversary of the attack. In Japanese culture, if someone folds 1,000 origami cranes, one wish will come true. So Thompson de la Chenelière made 6,000 cranes, and with them, six wishes: one for each of the men who died on Jan. 29, 2017. The 16-year-old then placed the cranes on a map of the world and included his wishes in French and in Arabic. "I hope that everyone will remember violent events like that of January 2017, to make sure it never happens again," is one of the wishes. "I hope everyone in the world learns to love and respect each other," reads another. Cranes are often considered a symbol of peace and healing. Thompson de la Chenelière said that for him, they represent his wishes for peace and harmony in the world. "When the killings happened at the mosque, it really troubled me," he said. Thompson de la Chenelière said two children of one of the victims, Azzedine Soufiane, attend his school. "I realized how close these horrors were to me, and I wanted to do something about it," he said. "So I used my project to honour the people that died and denounce the horrors." The six wishes on the project were translated into Arabic by a member of the Islamic Cultural Centre of Quebec.